"A Trump Administration will also ensure that we start using American steel for American infrastructure." By Gabrielle Healy on Wednesday, April 5th, 2017 at 10:11 a.m.
President Donald Trump pledged to use American steel for infrastructure projects as an appeal to working-class voters and members of the steel industry. Now that he's in office, Trump seems to have narrowed the focus of this promise. He issued a limited presidential memorandum on Jan. 24 calling for U.S oil pipelines to use American steel in their construction. The memorandum directed the secretary of commerce to "develop a plan under which all new pipelines, as well as retrofitted, repaired, or expanded pipelines, inside the borders of the United States," use materials and equipment produced in the United States, "to the maximum extent possible and to the extent permitted by law." Yet the promise has hit a couple of public relations setbacks. The high-profile Keystone XL pipeline will not have to use only American steel in its construction.White House spokeswoman Sarah Huckabee Sanders explained during a press gaggle on March 3. She said it was because the Keystone XL pipeline was not a "new" project it was not bound by the memo. "The steel (was) already literally sitting there, it would be hard to go back," said Sanders. 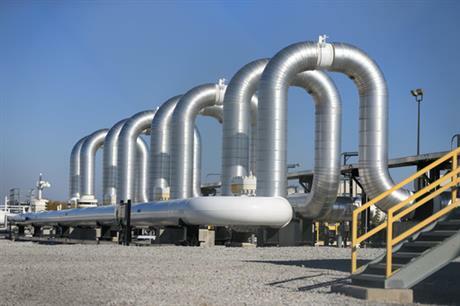 The company building the Keystone XL pipeline, TransCanada, said in a 2012 press release that half of the steel for the pipeline will come from an Arkansas plant of the India-based company Welspun. Trump promised on the campaign trail to invest $550 billion in infrastructure spending but he has not yet offered a bill on this issue to Congress. If and when he does, we'll look to see if there are American steel requirements in the legislation. These developments regarding the pipeline suggest Trump may run into complicating factors in trying to keep his promise to dictate what type of steel private infrastructure projects use. Thus far, we rate this promise Stalled. By Lauren Carroll on Monday, January 16th, 2017 at 12:39 p.m.
Donald Trump promises a significant investment in transportation, telecommunications and other infrastructure projects, and he'll use American steel to build them. This promise is part of his overall pledge to revive the manufacturing industry. "A Trump Administration will also ensure that we start using American steel for American infrastructure," he said in a June 2016 speech about the economy. Despite this pledge, Trump himself has relied on Chinese steel in his real estate ventures — a contradiction critics have been quick to point out. Trump's focus on revitalizing the American steel industry is one reason Trump appealed to voters who have been negatively affected by the shrinking number of reliable manufacturing jobs in America over the past few decades. Trump says his plan to put steel "into the backbone" of American infrastructure will create thousands of new jobs in steel manufacturing. American steel production was 87 million metric tons in 2013, down from a peak of 137 million metric tons in 1973. Steel industry employment was 142,000 in 2015, compared to a peak of 650,000 in 1953. There are a few reasons for this drop. Imported steel is often cheaper than American steel because some foreign countries — most notably China — subsidize steel production. Additionally, labor productivity has increased dramatically over the past few decades, meaning fewer people are required to do the same amount of work. Conceivably, Trump would have to use Congress or executive orders to strengthen existing laws that encourage American product preference in federal capital infrastructure projects. These regulations include the Buy America law, which applies to the the Department of Transportation, and internal Environmental Protection Agency rules that require certain projects to use American iron and steel. But there are plenty of exemptions. For example, builders can get a waiver if comparable foreign products are significantly cheaper, or there is no domestic source for the desired product. And the America-first preferences don't apply to every country, due to international trade agreements — many of which Trump says he will renegotiate. On top of plugging up the loopholes in American product preference regulations, Trump would have to confront market forces that affect how American steel prices stack up to Chinese steel prices. Also, automation and other innovations in steel production limit how many jobs he could bring back to the industry. He might face some political pushback from Republicans who favor the free market and therefore don't want to expand these types of regulations. Interestingly, Trump may find a friend in Democrats who do support favoring American manufacturers, as well as increasing infrastructure spending. A campaign rally in Monessen, Pa.